Brian Fargo's inXile Entertainment is working a new game featuring "Torment" in its title, but don't expect the Kickstarter-funded Tides of Numenera to pick up where 1999's Planescape: Torment left off. Though we've known about Torment: Tides of Numenera for quite some time, the game was only officially announced this morning. Alongside the announcement developer inXile Entertainment also offered up a host of new info on the game, though fair warning, those of you who've been playing PC roleplaying games for years might not like what you're about to read. Let's get the bad news out of the way first: Torment: Tides of Numenera is not a sequel to Planescape: Torment. It vaguely shares a setting ("Torment" refers to a segment of the expanded Dungeons & Dragons universe), but since that setting consists largely of otherwordly spaces in which humans, demons and all manner of other creatures can jump to other realms via a nigh-infinite number of magical doorways that doesn't really mean much. More accurately, Numenera's setting is a new realm created relatively recently by famed game designer Monte Cook. If that name sounds familiar, it's for one of two reasons: Either you're confusing it with the Numa Numa kid, or you heard about Cook's recent Kickstarter campaign launched to fund Numenera's creation. Cook initially sought $50,000 to cover his development costs, but fans turned out in droves and pledged a massive $517,255 before the fundraiser drew to a close. So if this new game isn't a follow up to Planescape: Torment, why would inXile affix "Torment" to the title? That's false advertising, right? Not exactly. Though the games aren't set in the same geographical location, and won't feature the same wacky cast of characters, Torment: Tides of Numenera is a spiritual, thematic sequel to Planescape: Torment. Fargo claims that Numenera will feature "complex and nuanced morality decisions" which push players toward "carefully contemplating deep and reactive choices with consequences that echo throughout the game." That's a pretty solid way to describe Planescape: Torment as well, so we're happy with this. 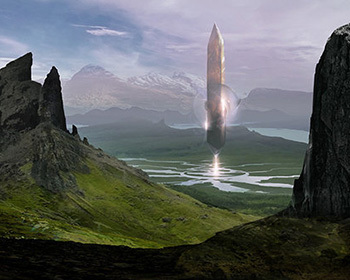 "Numenera's Ninth World is a fantastic vision of a world in which massive civilizations continue to rise and fall with only cities, monuments, and artifacts left behind to serve as reminders of their past existence. These reminders have become part of the accumulated detritus of eons and now this assortment of ancient power is there for the taking," this morning's announcement states. "In Torment: Tides of Numenera, players will have to decide for themselves the eternal question, what does one life matter?" No doubt driven by the success of Monte Cook's Kickstarter, inXile plans to launch a fundraising effort of its own this Wednesday. Specific details on that Kickstarter effort are currently scant, but we expect that the revelation will also offer our first chance to read truly in-depth information on what Fargo and pals intend to accomplish with Torment: Tides of Numenera. Or, failing that, it should at least give us some useful screenshots of the game. Here's hoping at least one includes a floating skull whose horrific memento mori appearance is matched only by his rapier wit and sarcastic ennui toward existence as an ambulatory brain casing.